The beautiful month of Bhadrapada comes again to provide us with the wonderful opportunity to honour and worship Lord Ganesha through the celebration of Ganesh Chaturthi. 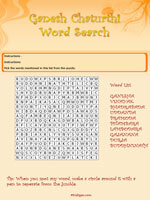 Add to your Ganesh Chaturthi festivities with some exciting word puzzles based on the mood of the occassion. 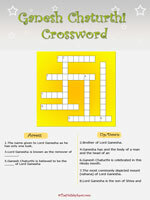 Try out our interesting Ganesh Chaturthi Crossword Puzzle, tickle your braincells with the Ganesh Chaturthi Word Search Puzzle and have fun! We plan to add some more activities soon. If you like these cool word puzzle activities themed to Ganesh Chaturthi, click here and transmit this page to your friends, loved ones and all puzzle enthusiasts you know. Have a merry Ganesh Chaturthi celebration with all you know. Shubh Ganesh Chaturthi!